DAVIS ISLAND, Miss. (AP) — An alligator that was 14 feet, one-quarter-inch long and weighing 826 pounds broke Mississippi records that other alligators had set earlier that day for length and weight. 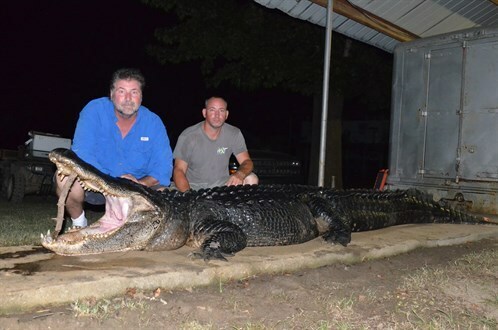 The alligator shot Saturday by Kenny Crechale of Morton is the first officially documented in the state at more than 14 feet long, Ricky Flynt, head of the state Department of Wildlife, Fisheries and Parks' alligator program, told The Clarion-Ledger. He said Crechale was hunting with Ronnie Clifton of Petal on private land on Davis Island in the Mississippi River. “Private Land permit holders are allowed to take alligators with a high-powered rifle, but only during daylight hours,'' he wrote in an email. The animal's tail was 4 feet around, and its belly girth was 5 feet, 8 inches. Earlier Saturday, Flynt had certified an 822-pound gator as the heaviest and a 13-foot-7-and-three-quarter-inch specimen as the longest ever caught in the state. Clayton Gibson of Natchez harvested the 822-pound reptile, and Angelia Rivers took the 13-foot, 7 3/4-inch one.